My husband and I were on the hunt for the perfect coffee table for our living room for what seemed like FOREVER! We wanted something old, something with character, a project! We hit up every antique mall, garage sale and second hand store in the area and were beginning to think that thee table did not exist. We tried to think outside the box - we searched for unique objects that might make for a creative base or re-claimed molding and wood that we could re-purpose but still NOTHING ... until we stumbled upon the Indie Art & Vintage Marketplace. For starters, the Indie Arts & Vintage Marketplace is great! This outdoor marketplace takes place one Saturday a month at the Glendale Towne Center in Indy. It began May 4th and goes through October 5th (the remaining dates are August 3rd, September 2nd and October 5th). There are many vendors offering "vintage, antique, modern, shabby, chippy, rustic and eclectic" items. Cost is $5 per person. The event also features food trucks and beer for purchase. 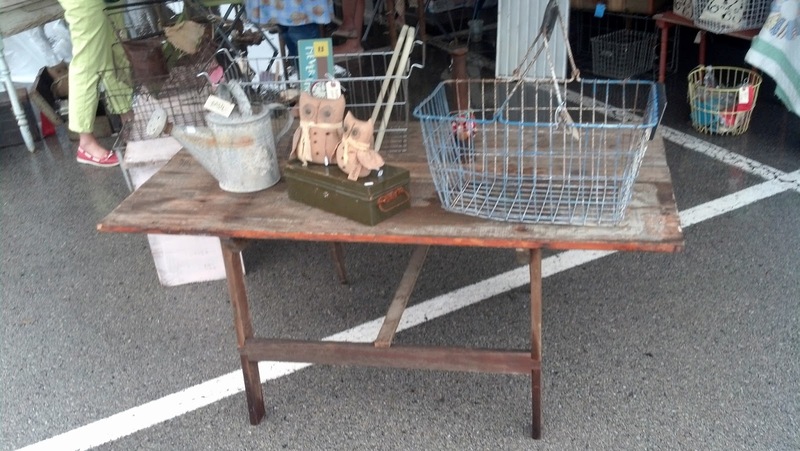 We walked around the marketplace looking for key items that might be able to be used for a coffee table, and then we saw it ... an old, antique folding table with rustic appeal! The table is made of old wood and coolest part is that the legs are designed to fold in. There were some knots and discoloration, which we loved! The got the table for a heck of a deal - $40! There were a few issues with the table though. For one, it was too tall - the table is intended to be used with chairs. Also, there was some glue dried to the top. So, my husband and his friend sawed off the legs creating a 19" high coffee table, and I started refinishing! I began refinishing by using a stiff brush to clean off the table and knock down some of the glue. I then took some sand paper and lightly sanded down the areas with glue. I intentionally did not sand out all of the imperfections because I wanted to keep the character. Once the table was cleaned up, it was ready for its finish. After some research, I choose to finish the table with Tung Oil Finish. Tung Oil Finish penetrates and protects wood making it water resistant. We chose a low gloss version that will provide a beautiful hand rubbed finish. To use the Tung Oil Finish you simply need the oil, wipe cloths and gloves (all can be purchased at your local hardwood store). All the supplies cost me about $15. I applied the first coat of oil over the whole table, top, legs, etc. You pour the oil on your rag and begin rubbing it into the wood, like you would wax a car - a thin coat is suggested. It only took we about 20 minutes to apply the first coat. Look how much that one thin coat enhanced the look of the old wood! Talk about breathing new life into an old piece! After letting the first coat dry over night, I applied a second coat for added protection and let it dry over night once again. And that was it! Only Fifteen dollars worth of supplies about 1 hour total labor, and we now we have a beautiful, character-filled coffee table that's one-of-a-kind ... and it was so easy!